In Windows 8.1 you might not want Modern apps cluttering up the Taskbar. Here’s how to prevent Modern apps that are running from appearing on it. Windows 8.1 update allows user with a traditional computer with mouse and keyboard to use the Modern UI more easily. 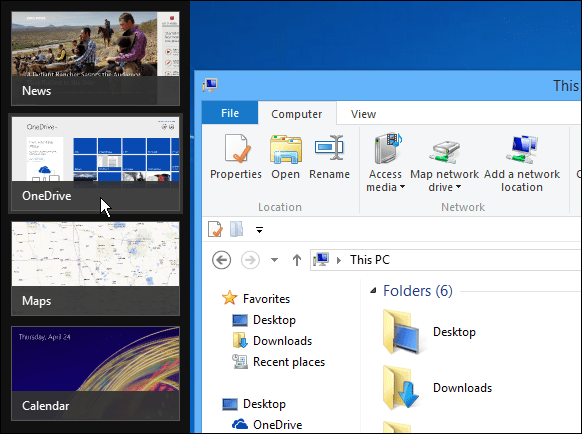 Not only does it make it easier to use the Modern apps and tiles with your mouse, it also integrates certain elements of the desktop and Modern UI. The update has new features for Modern apps. You can pin Modern apps on the Taskbar, and they will show up while running in the background. Personally I enjoy this new feature because it allows me to see what’s running in each environment. But it can clutter up the Taskbar and some of you might want to keep the Modern apps off of it. 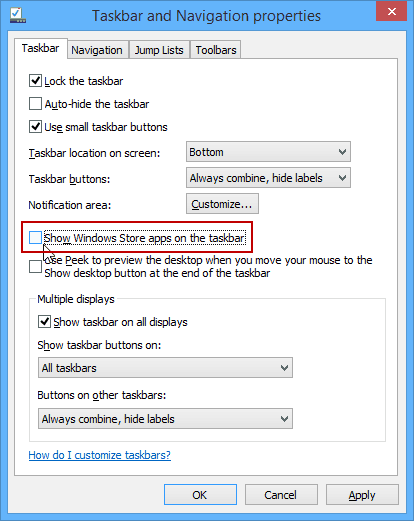 Here’s how to stop Modern apps from the Windows Store from appearing on the Taskbar while they are up and running. To stop the behavior, first, remember that you will need to be running the Windows 8.1 update which is technically named KB2919355. Then go to the desktop, right-click the Taskbar and select Properties. In the window that comes up, make sure you’re under the Taskbar tab and uncheck Show Windows Store apps on the Taskbar and click OK.
That’s all there is to it. Now when Modern apps are running they won’t show up on the Taskbar. If you want to see which Modern apps are running, use the keyboard shortcut Alt + Tab — which will show all running desktop programs too. Or hover the mouse over the upper left or lower right corner of the screen. It’s also worth noting that if you disable this feature, you can still pin Modern apps to the Taskbar. They just won’t show up while they are running. Of course if you’re more of a “purist” and would rather not see anything from the Modern UI on the desktop, don’t pin any apps to the taskbar. Great tip, Brian. I am actually happy to have the Win8 Apps show up in the taskbar, instead of having to alt-tab to them. Before your article, I didn’t know it was even possible. Now I hate Win8 a little less.